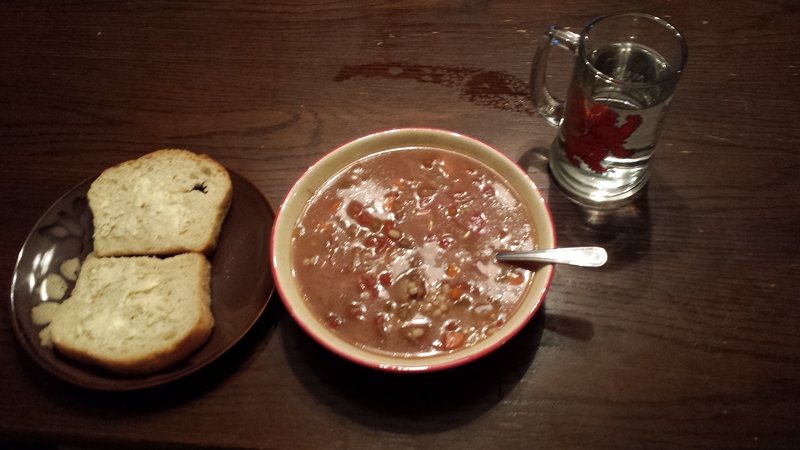 Beef and Barley soup is, without a doubt, my favorite winter comfort and home remedy food. If the pot has soup in it after two days, send a search party, because I usually like the pot to finish. My love for this type of soup originated with the Campbell’s Soup variety and now, just as I did then, I can’t stop eating it until the pot is empty. Even better than that, the nutritional elements of this homemade soup far exceed that of any canned variety. It’s breakfast, lunch, supper, and in-betweensies when I make this soup. Hope you enjoy this hearty traditional favorite of the MacCurdy family! You will need a bag of 2 lb soup bones. Cook in a 4 quart soup pot. Make sure that the bones are completely immersed in water. Bring all ingredients to a boil. Turn down and simmer for a minimum of 12 hours (I did it over night) and up to 48 hours. The longer it cooks, the more flavor emerges. Skim the scum as you simmer. Remove the bones and give to the dogs for a treat if they are still hard. I used a soup ladle to fill freezer containers with the excess stock that I didn’t use in the beef and barley soup. 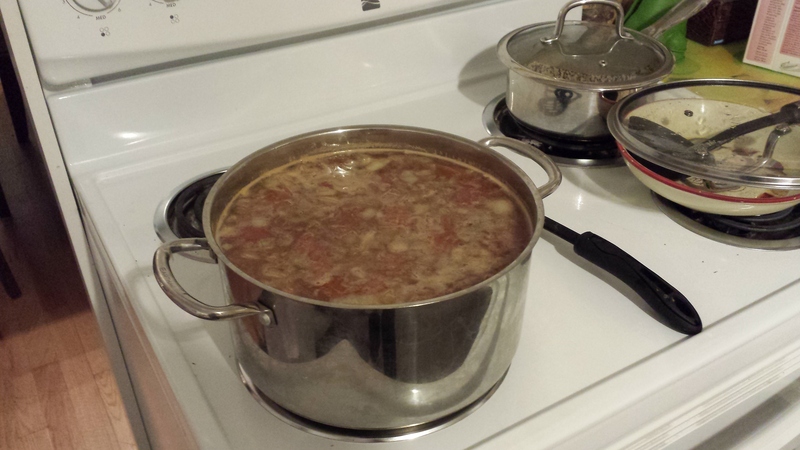 In a large soup pot (4 quart), add your beef stock, water, diced tomatoes, and spices. Saute the vegetables in a separate pan or simply add them to the soup after it has been brought to a slow rolling boil. Add your beef (I’ve used uncooked stewing meat and leftover roast on separate occasions although I prefer cooking the stewing beef into the soup. Add the 1/2 cup of pearl barley and cook the soup for 45 – 60 minutes. Taste to check to see that all ingredients are tender and cooked. Serves up to 12 individual bowls. Serves well on cold Winter days and during cold/flu season. Spruce yourself up with this homemade belly warmer. Finally, a big shout out to Mark Hengst for his cooking wisdom for producing healthy soup stock.